PBS Science Guy - Do You Remember Bill Nye? PBS Science Guy - Great Stuff for the kids! Search for more about science. The PBS Science Guy Redeems the Value of TV Shows. Can TV shows do kids any good? You might think answer to that question is a hearty "No!" Public television, however, has changed all that with the PBS Science Guy named Bill Nye. With their funny music videos that teach basic science information and fast pace of humor, this show has changed the way kids look at science. The programs, which won Emmy awards, were created between 1992 and 1998, and consist of 100 different episodes. Currently the program is syndicated so that it might appear on stations other than public television. Canadian kids currently have a science tv program called Grossology. If you want to buy the program in a video or DVD format, however, it is available. The DVDs were released with licensing for schools, which makes them expensive for regular consumers. They can be purchased from Disney, maybe through Amazon or Ebay. Fortunately, the videos, which are no longer in production, can be found second hand in some instances. My local library has a few of them as well. PBS Science Guy - Just on TV? Another way to tap into this Science Guy and his ideas is to buy a book he wrote. One such book is named Bill Nye the Science Guy's Consider the following: A Way Cool Set of Science Questions, Answers and Ideas to Ponder. This book is geared to kids in grades 4 to 7. The 112-page book provides four pages on each question kids might like to ask a scientist. The discussion includes important terms and an experiment that will be fun and easy for kids to do. Bill Nye has also written science books on individual topics of interest to younger people. For instance, he has covered topics like germs, the ocean, and dinosaurs in individual books. I hope there is one about weather. Some parents might want to know that Nye's science supports evolutionary theory. Since the days of Bill Nye the Science Guy programs, Nye has made another series of programs called "In the Eyes of Nye." These episodes look at issues in the news from a science perspective and is aimed at adults. 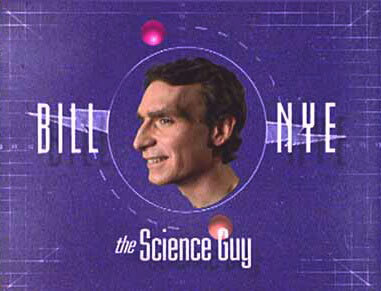 Bill Nye has made advanced science concepts accessible to kids through a variety of videos and books. Look for his programs on syndicated television, too. Wanna be informed and entertained? Check out this video on the SCIENCE of LAUGHTER. Go back from PBS Science Guy to the Weather Equipment page or visit the Stuff in the Air homepage. Feel free to leave your comments for publication below. Downside of Disney's New Movie "UP"
Bill Nye is an amazing guy!